Haplogroup T was formerly called K2 and was first called T in the Karafet et al (2008) paper. Identical SNPs that were discovered separately are listed in alphabetical order, not necessarily in the order of discovery, and separated by "/". Examples M184/USP9Y+3178. Y-DNA haplogroup T is found at low frequencies throughout Europe and in parts of the Middle East, North Africa, and West Africa. A famous person in Haplogroup T was Thomas Jefferson (1743-1826), the third President of the United States from 1801 to 1809. Removed G. Hudjashov, Peopling of Sahul: Evidence from mtDNA and Y-Chromosome. Thesis (M.SC.) University of Tartu, Estonia, 2006 as the paper is no longer accessible on 17 March 2009. 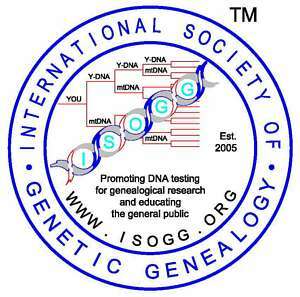 Copyright 2009, International Society of Genetic Genealogy. All Rights Reserved.